Lieutenant-Commander Joseph MacBrien and his wife after the Canadian naval aviator is presented with an American Distinguished Flying Cross in 1954. PHOTO: CANADIAN FORCES—O-7147. It may suprise some that all three branches of the Canadian armed forces were busy in the cold, turbulent air over Korea between 1950 and 1953. Their experiences are not well known, but they did their duty by attacking ground targets and engaging MiG-15s. The transpacific airlift in support of United Nations forces in Korea was the Royal Canadian Air Forces’ largest contribution during the 1950-53 war (Operation Hawk: The Korean Airlift, July/August), but it was not the only operation that drew Canadian airmen to the peninsula. “Thou shalt have air superiority” is the first rule of air power, and this was quickly achieved after war broke out in June 1950. By the end of August, the North Korean Air Force was eliminated, and all airfields in North Korea were thereafter attacked ruthlessly. The only “safe haven” for Communist fighters was in Manchuria, home to several MiG-15 fighter wings. These were formidable enough to halt B-29 daylight raids on North Korean targets. The MiGs, however, lacked the range to engage directly in front-line operations and so the UN forces were never threatened by enemy air attacks, either at the front or in rear areas. As of June 1950 no RCAF pilot had flown any fighter more advanced than a de Havilland Vampire. Once the RCAF began training Sabre pilots (with Canadair of Montreal producing Sabres for the force), the bulk of these pilots and machines were directed to home defence or to meet our NATO commitments. Nevertheless, it seemed smart to familiarize a few pilots with jet warfare lest our NATO squadrons become involved in a European war. Flight Lieutenant J.A. Omer Lévesque, a Second World War veteran, was serving on exchange duties with the 4th Fighter Interceptor Wing when it went to Korea. On March 30, 1951, while escorting B-29 bombers on a daylight raid, he destroyed a MiG-15. He was subsequently awarded both an American Air Medal and an American Distinguished Flying Cross, DFC. Lévesque’s presence in Korea was more by happenstance than intent. Initially there were no plans to inject RCAF fighter pilots into the Korean air war, although the USAF was willing to rotate Commonwealth pilots through American formations. The RCAF was unable to accept the offer until 1952. Twenty four Canadian Sabre pilots were thereafter attached to American Sabre units in Korea, and they served under severe limitations. The normal Sabre pilot tour was 100 missions; RCAF pilots were restricted to 50. Thus, just as they were beginning to get the hang of jet combat, they were pulled back to Canada. The only exception to the 50-mission rule was Flying Officer S.B. Fleming who arrived before details of the scheme had been settled; he flew 82 missions. Thanks to an informal old-boys network, most of the RCAF Sabre pilots were Second World War veterans. One youthful pilot, F/O J.C.A. LaFrance, complained to his superiors, arguing it was junior men like himself who most needed combat experience. LaFrance won his point—and a Korean assignment. He proved to be a very “hot” pilot; on Aug. 5, 1952, he destroyed a MiG-15. LaFrance rose to the rank of major-general in the Canadian Armed Forces. The Americans were generous in distributing Air Medals and their version of the Distinguished Flying Cross. Flight Lieutenant Ernest A. Glover, another “old sweat” from the Second World War, joined the USAF’s 334th Fighter Squadron at Kimpo (Seoul) in June 1952. Up until Aug. 26 he never saw a MiG; from then until the end of September he saw them nearly every day. He was ultimately credited with three MiG-15s destroyed, for which he was awarded both the American and Commonwealth DFC. In November 1952, Squadron Leader Andrew R. Mackenzie was assigned to the USAF’s 39th Sqdn. He was the most experienced RCAF fighter pilot hitherto assigned to Korea, having earned a DFC in 1944 and been credited with eight and a half German aircraft. Ominously, he was the 13th pilot dispatched under the rotation scheme. 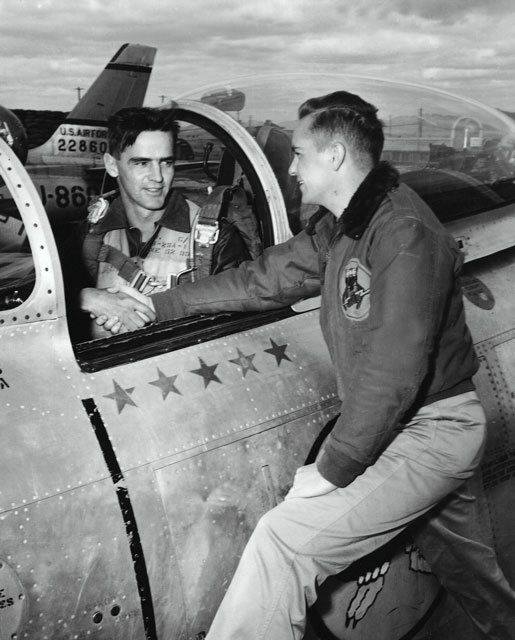 On Dec. 5, 1952, he was shot down in a “friendly fire” incident, bailed out and was captured. At first he was treated well, but soon the enemy turned on him. He endured countless interrogations, poor food, “brainwashing” attempts and 465 days of solitary confinement during which time he lost 70 pounds. It was not until April 1954 that he was allowed to write to his family and he was not released until December 1954—two years after his capture, 17 months after the Korean Armistice. Space does not permit a fuller telling of the RCAF Sabre pilots’ Korean experiences; a lengthy article on the subject was published in the winter 1986 edition of the Canadian Aviation Historical Society Journal. Throughout the war the USAF, United States Navy and allied air forces waged a campaign to destroy enemy supplies en route to the front. The only Canadian serviceman engaged in these interdiction operations was Lieutenant Joseph James MacBrien, one of the RCN’s most experienced naval aviators. He was assigned to the USN on exchange duties in March 1952, flying F9F-5 Panther jets from the carrier USS Oriskany which began operating off the east coast of Korea in November 1952. In the next six months, MacBrien flew 66 sorties, including 50 ground-attack strikes against billeting areas, industrial centres, rail targets and power plants. In June 1954, he was awarded an American DFC. The RCN attempted to learn as much as possible from Royal Navy carrier operations off Korea. A conference held in September 1951 featured Captain Arthur S. Bolt, late of HMS Theseus, which had flown rocket-firing Sea Furies and bomb-carrying Fireflies on tasks that included air patrols, bombardment spotting and tactical air support. During its cruise, Theseus had been free of air opposition but had lost eight aircraft, most to ground fire. The RCN noted these experiences, and was preparing to dispatch a few aircrew to the Far East when the Korean War ended. The Commonwealth Division, formed in the summer of 1951, had two Air Observation Post (AOP) Flights, Nos. 1903 and 1913. Ostensibly Royal Air Force units, they were manned almost entirely by army personnel. They were equipped with Auster VI aircraft, although one American L-19 was acquired when it was discovered that the portly Divisional Commander, Major-General A.J. Cassels, fitted poorly into an Auster. Korean AOP operations resembled the static, siege warfare of the First World War. Pilots flew alone and most sorties were limited to a depth of 5,000 yards behind enemy lines. They were also flown at between 3,000 and 5,000 feet, avoiding most of the small-calibre anti-aircraft fire which the Chinese routinely threw at the machines. In the summer of 1952 the enemy strengthened its anti-aircraft defences and conditions became most unpleasant for AOP pilots. The depth of penetration was reduced and operating altitudes increased. Commencing in July 1952, the Canadian Army began rotating AOP pilots through No. 1903 Flight. Capt. J.M. Liston arrived on July 31, 1952, and was shot down on Aug. 13. He was observing a Chinese artillery position and had gone to 7,200 feet to avoid both anti-aircraft fire and a planned USAF strike. Height did not save him. An 85-mm shell from an undetected battery struck the after fuselage, almost completely severing the tail which was held only by the rudder cables. He parachuted into Chinese hands and a year of captivity. Liston’s successor in No. 1903 Flight was Capt. Peter Tees who served from Sept. 15, 1952, to June 1953. Flying in a Korean winter was often uncomfortable, as shown by entries in his logbook. “Bloody cold,” he wrote on Nov. 18 and Dec. 21, 1952. “Very cold,” he wrote on Dec. 20. “A freezing aircraft,” he noted on Jan. 6, 1953. Tees also reported snowstorms, turbulence, rough running engines and cracked exhaust pipes. He had several outstanding sorties, the most notable being on May 3, 1953, when Royal Canadian Regiment positions came under fire from infiltrating Chinese infantry and armoured forces. The infantry called down artillery fire on their own positions. Tees arrived at first light and spotted known and previously unknown targets. He directed excellent shooting and was thwarted only when the Chinese retreated under a dense smokescreen. 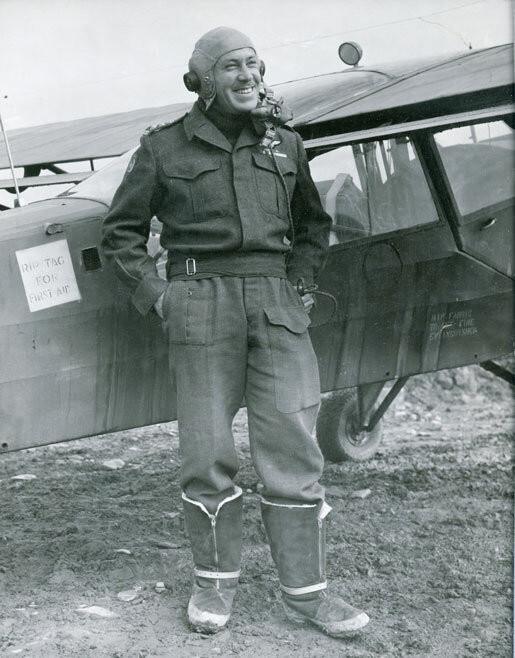 Ultimately, Tees was awarded a Commonwealth DFC—the first to a member of the Canadian Army since 1918. As early as July 1950 it was realized that jet fighters were too fast and fuel hungry to hunt for ground targets. If an objective was found and marked, the F-80s and F-84s could deliver a telling load of rockets, bombs and napalm. But who was to find the targets? The American Army improvised so-called “Mosquito” Flights. In this instance the “Mosquito” was not the sleek, fast combat aircraft of the Second World War. It was a T-6 Harvard or Texan to Americans. These reconnoitred for targets, then marked them with smoke grenades and rockets. The pilots were members of the USAF while the backseat observers were army personnel. Operating singly and at low altitude, the aircraft were vulnerable to ground fire. At least 17 Canadian Army officers served as “Mosquito” observers, 15 during the war itself and two following the Armistice. Nine were decorated by the Americans. On average, they completed approximately 45 sorties during a three-month attachment. However, Lieutenants Arthur Magee of the RCRs and William E. Ward of the Lord Strathcona’s Horse flew 162 and 88 sorties, respectively. Our role in the Korean War may have been primarily an army affair, but personnel of all three fighting arms carried the name “Canada” into the air in many ways and places.